Thailand - Mamuang, Saparot, Mangkut! : Dive, Dive Dive! 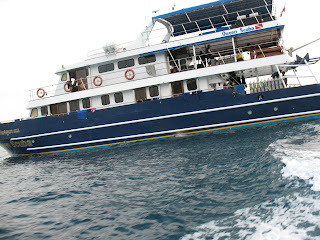 Our first night aboard the Queen Scuba was a restless one. There is a/c in the cabins, but it is woefully inadequate. 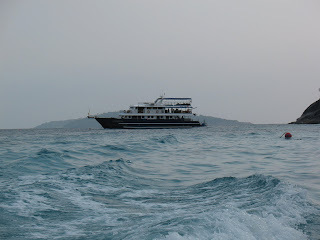 Also we were motoring to the Similian Islands all night and the engine was loud. 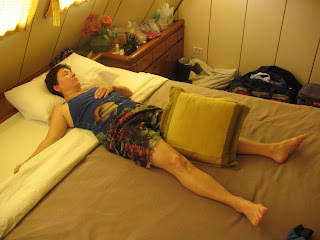 Add to that the new feeling of the rocking of our vessel and we didn't get much shut-eye. 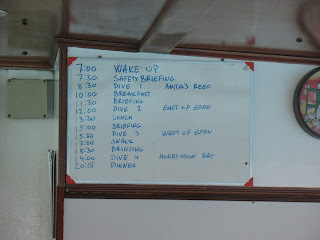 Morning comes early on a dive boat. At 7:00 on the dot a booming voice bellows "WAKE-Y, WAKE-Y!" We cannot ignore it and drag ourselves out of bed. The "first" breakfast is served at 7:00, consisting of toast, some other pastries, delicious banana bread, cheese, jam, cereals, tea and coffee. 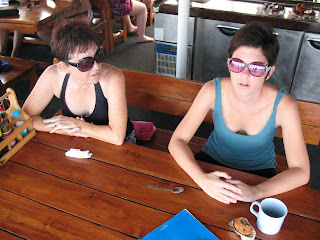 We fortify ourselves knowing that we need nourishment to endure our first dive. I am already planning when I can fit in a nap. 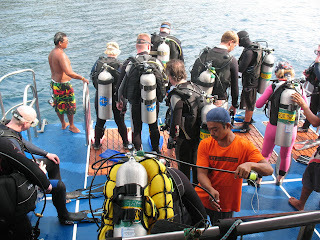 Each of the guests on the boat are assigned to a Divemaster for the duration. Since there is actually one divemaster from Arizona, we are figuring we will get him. However, we are assigned to Kim from Denmark. Turns out that we are Kim's only guests and we already like him. 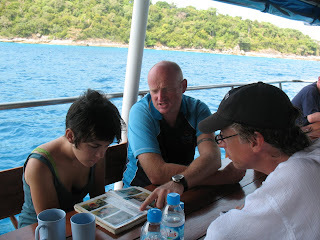 He gives us our personal briefing while the other divemasters serve their guest - many in other languages. (There are guests from Finland and Italy and I am not sure where else. We are the only Americans, but it seems like everyone speaks English). Time to suit up and get in! 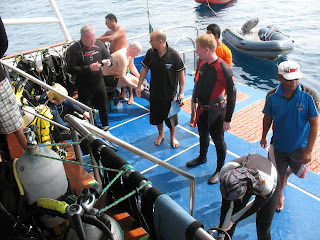 We are a bit nervous since it has been over 2 years since we have been diving. The crew is wonderful and they are all there to help with anything we need or want. It is very comforting. 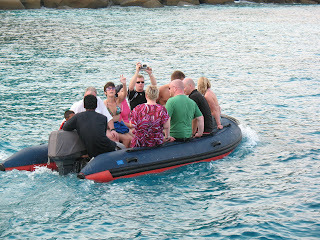 We take a giant stride off the back of the boat and are ready to go. The dive at Anita's Reef is a shallow, easy dive. Perfect for a "check-out" dive. The water temp is a wonderful 84 degrees. We find that our skills come back to us and soon we are all very comfortable in the water again. 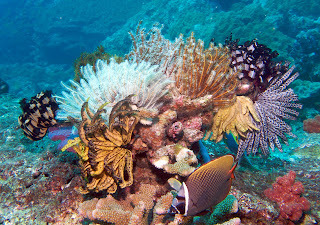 Since we have never dived in Asia, we see many creatures that we have never seen before. 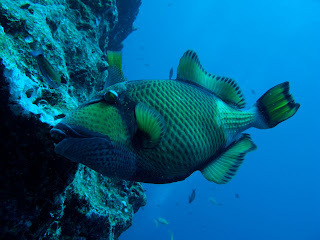 Sometimes the fish look familiar (like our Caribbean friends), but they are "wearing different clothes." Kim is fantastic at finding and pointing out many species. He writes their names on his underwater slate for us to remember. There are some small wrasses that we have been told may want to try and get in your ear or elsewhere to "clean" you. They keep bugging Rich and he shoos them away. Finally one comes and bites me on the lip - TWICE!! Fortunately they are pretty small fish and their bite is small - just suprising. 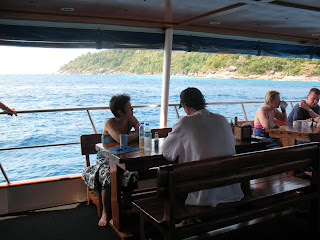 After the dive we get back on the boat and are immediately greeted by the Thai cook with a glass of pineapple juice. Nice. 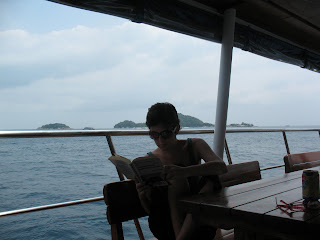 Once again - this is true luxury diving. All of the Thai crew are so helpful in taking complete care of you. We never have to touch our gear or move anything. It is awesome! 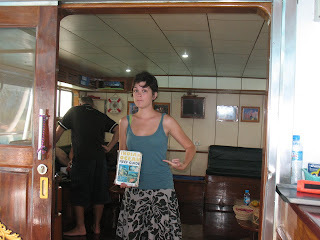 We sit down with Kim and a fish id book and go over some of the things we have seen. We head to our cabin to dry off a bit and soon we hear "BREAKFAST IS SERVED, BREAKFAST IS SERVED" booming down the hallway. Ahh. . . our "real" breakfast. We enjoy eggs, bacon, ham, tomatoes/onions, toast and juice. Diving makes you sooo hungry and the food tastes great. 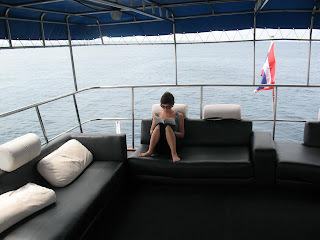 We relax for a bit and find time to spread out on the boat. Kim tries to show us something in a little cave, and we look and look but don't get what he is after. He writes on his slate "Ornate Ghost Pipefish." We still don't see it. Finally, we realize that the two pieces of seaweed we are looking at are actually fish! Very weird looking. Soon it is lunchtime (divers eat often and a LOT). Lunch is a variety of Thai dishes that are delicious. We chow down. Ok - this is where I had previously decided I could fit in a nap. I head to my cabin and pass out. We ascend from the deep and what do you know - it is snack time! We munch on muffins and espresso cake. Just what we needed. 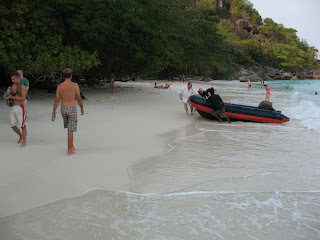 After the 3rd dive of the day, the boat motors to a beautiful cove with a gorgeous little white sand beach. Those who want may get in the dinghy and visit for awhile. Janel is ready and jumps in the first dinghy which is already full. 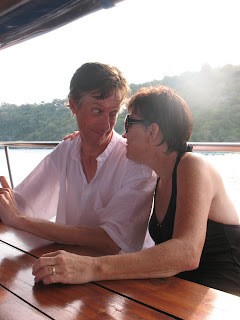 Rich and I wait for the 2nd dinghy and climb aboard. Rich takes a few parting shots of our "home" on the water. The beach is idyllic. There are a few bungalows where people are dropped off and can stay. 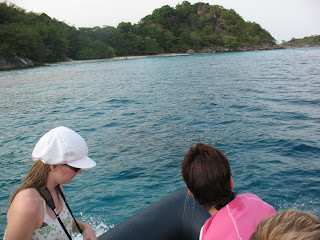 Mostly the island/beach is used by folks like us from dive boats. We wander around and let our feet get buried in the sand. 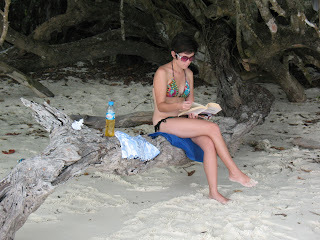 Janel finds a quiet place to read and chill. It doesn't get any more relaxing than this - "sabai, sabai." Remind you of "Blue Lagoon?" 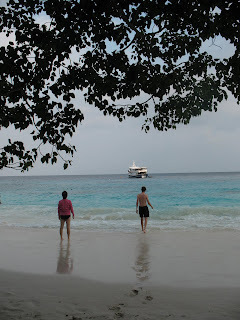 When it is time to head back to the boat the waves have picked up. The dinghy is rockin' and rollin' before we even can get aboard. One girl in our group manages to climb in just before two huge waves hit. She rides the dinghy like a surfboard and raises with the crests of the waves. Impressive! We all manage to get on (some of us have to be physically pulled on our bellies to get on the dinghy...) and head back to the Queen. There is a night dive scheduled for tonight. Janel and Rich both love night dives. The jury is still out for me. I love seeing the creatures that come out at night, but the "spooky factor" still gets me. Kim briefs us on the creatures we might encounter and we discuss the possibilities. A night dive??! Are you sure? Ok, as long as you will protect me! There was quite a discussion regarding flashlights for the dive. It seems there is quite a difference of opinion with language use between the Brits and the divemaster from Arizona (and us). The Brits say we are going to use "torches." We call them flashlights (of course). We were asked if we needed torches for our night dive and I snarkily responded that I didn't really want to try and use fire underwater. . . give me a flashlight, please. We ascend into darkness and once again board the boat. 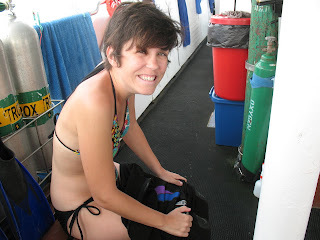 The captain's little boy greets us immediately on the dive deck and asks "would you like a hot towel?" Why, yes - yes I would! We shower and get into dry clothes again. (wet, dry, wet, dry - all day long). 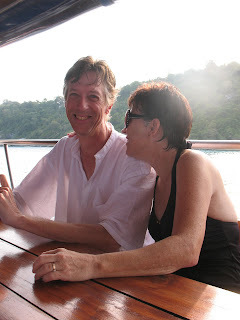 Janel and I pop a Singha beer - our first of the day (you cannot have alcohol if you will be diving). It is sublime. Dinnertime! Dinner is another delicious Thai meal with curries and a wonderful soup with coconut milk and oyster mushrooms. I didn't think I was a bit hungry, but I chow down anyway. Everyone chills out after dinner. It is not hot out here on the water. There is a great breeze and it feels good. I head into the Salon with the laptop to start today's blog. There are others in the salon working on their cameras, laptops and generally chatting. Rich is still fighting his illness (upper respiratory) and retires early. Janel and I stay for a little while and then hang it up for the night. I hope we sleep a little better tonight. Tomorrow morning's call will be at 6am.